New Rochelle, NY, November 14, 2018–Mice with heart failure that were treated with AAV8-based gene therapy to deliver the protein urocortin 3 (UCn3) had increased blood levels of UCn3 over a 5-week period and improved heart function. The mice received a single injection of AAV8.UCn3 after cryoinjury to induce left ventricular heart failure and showed significant improvements in both systolic and diastolic heart function, as re-ported in an article published in Human Gene Therapy, a peer-reviewed journal from Mary Ann Liebert, Inc., publishers. 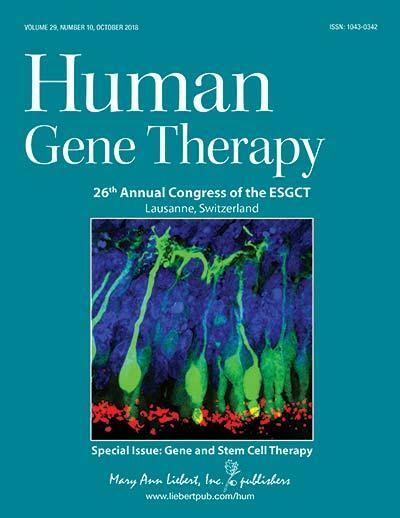 Click here to read the full-text article free on the Human Gene Therapy website through December 14, 2018. The article entitled "Urocortin 3 Gene Transfer Increases Function of the Failing Murine Heart," was coauthored by H. Kirk Hammond, Veterans Affairs (VA) San Diego Healthcare System and University of California, San Diego and a team of researchers from those institutions, Maastricht University, The Netherlands, and Institute for Molecular Cardiovascular Research, RWTH, Aachen, Germany. The researchers presented data to support sustained elevation of plasma UCn3 levels and significantly improved left ventricular function (1.9 fold) and higher ejection fractions (32% relative increase) compared to mice who received a saline injection after cryoinjury. Research reported in this publication was supported by the National Institutes of Health under Award Number P01 HL66941. The content is solely the responsibility of the au-thors and does not necessarily represent the official views of the National Institutes of Health. Mary Ann Liebert, Inc., publishers is a privately held, fully integrated media company known for establishing authoritative peer-reviewed journals in many promising areas of science and biomedical research, including Nucleic Acid Therapeutics, Tissue Engineering, Stem Cells and Development, and Cellular Reprogramming. Its biotechnology trade magazine, GEN (Genetic Engineering & Biotechnology News), was the first in its field and is today the industry's most widely read publication worldwide. A complete list of the firm's 80 journals, books, and newsmagazines is available on the Mary Ann Liebert, Inc., publishers (https://www.liebertpub.com/) website.